We (1) capture what has our attention; (2) clarify what each item means and what to do about it; (3) organize the results, which presents the options we (4) reflect on, which we then choose to (5) engage with. Since version 3, Drafts has been a primary workspace for steps 1-3. It has been a tried and true capture tool that has powerful tools to organize those captured thoughts after they have been clarified. Drafts's inbox was used to store text with a badge on the app icon declaring how many drafts I needed to process. I would always try to get that number down to 0 every day. Nothing stayed in Drafts or was worked on extensively there. It was where text started, but never where it was completed. With last month's release of Drafts 5, I have added steps 4 and 5 of Allen's system to Drafts's workload. The two new features of version 5 that have added the most utility for me are tags and workspaces. While tags are self explanatory, workspaces are essentially saved searches allowing you to filter drafts by tags and search terms. 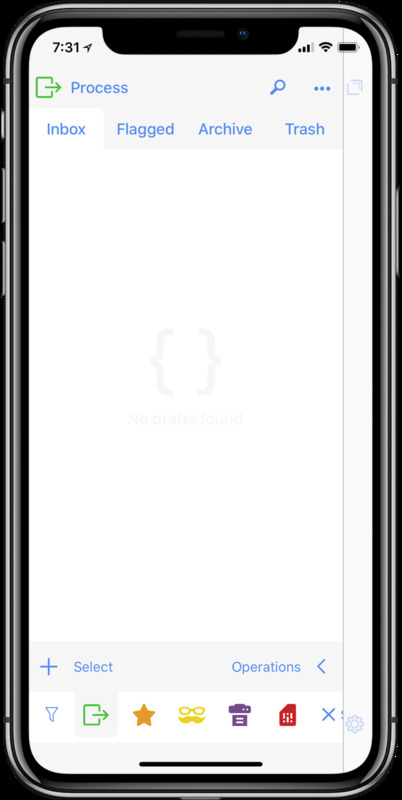 This lets you see the drafts you need only when you need to see them. Workspaces, along with Drafts 5's new, even more powerful scripting capabilities have allowed me to organize drafts, focus on only what I'm interested in focusing on at that moment, and still easily get the text out of Drafts for final publishing or usage. My first workspace, Process, filters all untagged drafts. It is My first workspace, Process, filters all untagged drafts. It isessentially my Drafts 4 style inbox. Whether it's an idea for a blog post, a task for Things, an email I need to send to a parents, or anything else, this workspace shouldn't have drafts in it for very long. I also have Drafts's badge settings correlate with this workspace with another new feature of Drafts 5. You can select what tags (if any) are included in the app's badge, and I currently have this set to "untagged." This helps me to remember to come back to this workspace and process my drafts. 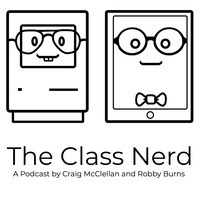 Micro Posts and The Class Nerd are for all things blogging. Unfinished drafts or ideas stay in the inbox, but tagged so they don't show up as needing to be processed. If I have time to write, I sit down and open one of these workspaces, pick an idea, and start working. Next, Newsletter is where I create my weekly newsletter for the parents of my students. I collect topics for the next newsletter throughout the week, then run a script to combine these individual drafts into one big newsletter every Monday, and finally convert the markdown to rich text and send the email to parents. The way I notate that blog posts, newsletters, or scripts are finished or posted is I simply archive the draft. They still maintain their tags, and I can view them in the archives of that workspace, but don't have to apply any more tags or anything different to them. This has become a really convenient way to organize my work, and I'll hopefully be incorporating more down the road. Actually having organization is allowing me to use Drafts as my daily driver for all things text related instead of having separate apps for separate purposes. Drafts 5 is available on the App Store as a free download with a $1.99 a month or $19.99 a year subscription to unlock pro features like workspaces.